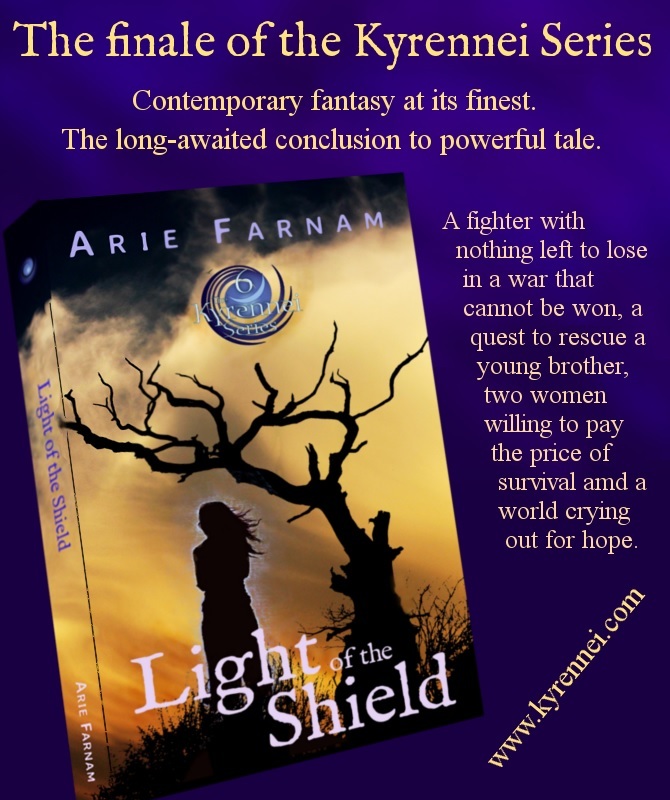 Here's a little treat for readers of The Kyrennei Series. 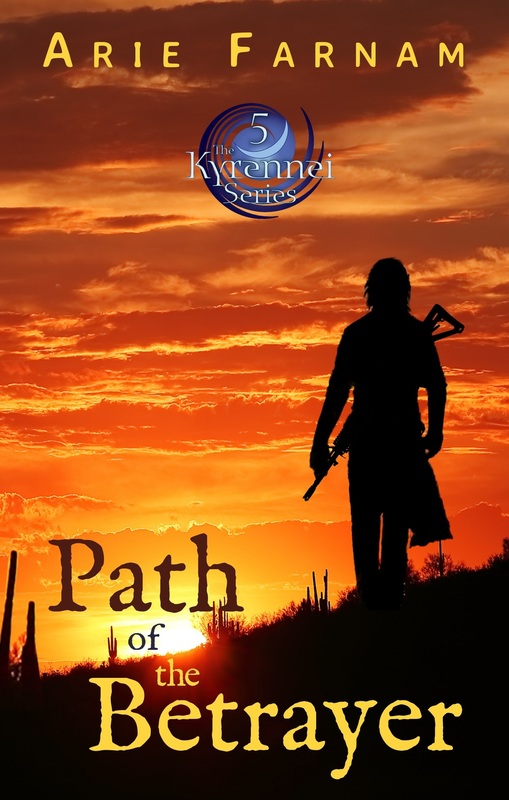 Path of the Betrayer (Book Five of The Kyrennei Series) is published Kindle users and will shortly be available in Barnes and Noble, Apple and other stores. Here you can read an expert from the middle of the first chapter to whet your appetite. I generally recommend that readers start at the beginning of series (The Soul and the Seed) because its world and characters are best experienced over the course of the story. But some readers here may be new to or long absent from the world of The Kyrennei Series, which looks eerily like our own world with a few subtle--yet nonetheless crucial--differences. If you're new, you need to know that the Addin is a power cult that can forcibly take your will. The Addin Association is a conglomeration of powerful political and business leaders who run today's society. The narrator is Kai, a twenty-two-year-old Meikan student who has lived all his life in fear of the Addin. He was captured by them when a Wisconsin farm where he was hiding was attacked. He now expects that the Addin will take him and force him to become one of them. There is no hope of psychic resistance. Any human being can be taken and controlled by the Addin no matter how much they resist. Kai is in love with Maya, a girl who is a member of the non-human Kyrennei race that the Addin are systematically annihilating because they disrupt Addin power. She was captured as well and Kai has every reason to believe she is already dead or soon will be. Read more of this story in Path of the Betrayer. You can get the Kindle book on Amazon and get the book at a discount until Friday, Oct. 30, 2015. Happy reading! If you're new to the series, keep in mind that you can get one book free by signing up for my hearth-side email circle here. Take a look at the pages for the series, primarily The Soul and the Seed. If you've already read one but not the others and have yet to get a free copy, sign up and then send me an email to let me know which book you'd like and what format. Readers of The Kyrennei Series love to ask questions about the premise, especially about how the Addin really works on the inside. There will be more on that coming in Book 5 of the series this fall, but for now here is a character interview that will answer some of the questions you have wondered about and add a little more spice to the summer. If you haven't yet started on the series, this interview doesn't contain any major spoilers, although you'll have to roll with a few unfamiliar terms. Reading this first may also have unexpected consequences in your experience of the story when you do read it. That could be a good thing, although I'm not sure what the results would be. Q: We'll leave aside how and why you're here talking to me for the moment because that is confidential. We'll start with the basics. Where are you from? Where were you born? And all that. I’m from La Grande, Oregon. I was born there. My mom was too. My dad was from Portland. They built our house out on Hunter Road. Q: You were friends with Aranka Miko as a kid, weren’t you? What was that like? We were friends for a few years, since we were seven or eight until we were twelve. It was great at the time. There weren’t any other girls my age who lived close enough to visit. We were active, outside most of the time. We played dress-up like a lot of girls, but we’d dress up in wild outfits and then we’d go ride our bikes down the gravel roads and get the gauze of our princess dresses tangled in our chains. Q: Was there anything out of the ordinary about her then? Would you have believed that she would play such a crucial role in the world? I mean she wasn't average or anything. She was kind of wild adventurous for a kid. She talked me into hiking to the top of Mount Emily to camp out by ourselves. My parents freaked out. She was never going to fit in with the mainstream, but neither would I, except for... well, all that. But still I never would have thought anyone from our little backwoods corner was going to do something like that. Q: Did your parents approve of your friendship with Aranka? My dad liked Aranka’s dad too. That was probably part of it. So, they didn’t have anything against us playing, but they believed she was uninvolved and that I would have to grow out of that friendship someday. Q: What was it like growing up Meikan in La Grande? It was okay mostly. I have to say. Even though some things were hard. We had our community. People stuck up for each other. A bunch of guys helped my dad build our house. If someone was sick, you always had people to help out. It was like having a big family. We were under pressure from the Addin but only as much as we could bear. It was more that you knew what your limits were. Uninvolveds talk about how “any kid can be president” and all that. We knew that wasn’t true. We knew we couldn’t even be mayor. But we also knew that we could live a reasonably good life if we just kept our heads down. At least that’s what I thought as a kid. Q: But then you were taken. Q: Why? If you obeyed the treaty, why were you taken? Accidents happen. I was always told it was because they didn’t know I was Meikan. That might have been true. Q: And afterward they couldn’t undo it? No! No, there is no way they can undo that. And they wouldn't even if they could. Q: Can you tell us what happened exactly? How you were taken? A family moved in nearby who had two girls a bit older than me. I guess they were fourteen and fifteen. My mom always made one little effort to welcome new neighbors, even though she was nervous about uninvolveds. She brought them cookies and some spring greens from our garden. Aranka wasn’t home that day. I think they went on a canoe trip. So, I went with Mom to see who the newcomers were. The girls weren’t very nice at first. Their names were Britney and Chelsea. I tried to act like I was their age to try to get them to accept me a little, but I don’t think they believed me. I didn’t think about the fact that someone like that might be Addin. I was twelve. It just didn’t occur to me. When I ran into them later, I kept trying to say hi to them, even though they didn’t say hi back. Once the younger one, Britney, commented on my clothes, laughing and saying she had the same skirt a few years ago, so I must have gotten it at the second-hand store. We weren’t dirt poor or anything and I’m pretty sure that we bought that skirt new, but we did sometimes buy clothes second-hand. My mom thought buying second-hand was socially and environmentally responsible. Or something like that. Anyway, I figured those girls weren’t going to have anything to do with me. Then one day a week or two before summer break they came up to me in the public library while I was checking out books and waiting for my dad to give me a ride home. All of the sudden, they were acting really nice. There were two other girls with them. One of them was Rose Sinclare who was an eighth grader and already a social queen. She smiled at me and said I was cute. I couldn’t help feeling good when someone so popular said something nice to me. Q: That's it? That's all that happened? They just accepted you and you went willingly because you didn't know they were Addin? No... It wasn't just that. When it happened I felt kind of dizzy. Like if you spun around in circles dancing really fast. I held onto the couch really hard and I must have looked a little weird. Then the girls were all laughing and patting me on the back. I didn’t know why I should feel anything, but I did feel a little different. I really wanted to be Rose’s friend and I wanted her to like me and like what I did and what I wore. I think that was the first thing. The rest of it sank in more gradually over the next few weeks. At first, they didn’t tell me anything about special Addin stuff. Q: But that still doesn't sound like a big deal. Was there ever a moment when you were shocked to realize you'd been taken? I started to wonder and the idea didn't bother me. Then I wondered why I'd been afraid of the Addin. It wasn't a single moment. It took a little while to really understand it. That's probably because I was so young. I wasn't shocked. I thought it was funny. I was a bit nervous about how my parents would react. Very briefly, but I knew they couldn't do anything to me. That made me kind of giddy, knowing that my parents were weak and brainwashed and I didn't have to do what they said every again. My dad got on my case when I got in the truck, saying I was being sullen and turning into a teenager. Then he started giving me a lecture about how you always have to use the sign, even if you’re pissed off or whatever. I’d just picked up the sign a few weeks earlier and I still wasn't entirely sure what had happened. But I couldn’t remember it. I couldn’t even remember what it was. I still don’t. I know it was something I could do for those few weeks, but it was just gone. I did get sullen then and I wouldn’t answer my dad. It took a few days before I told my parents straight out that I didn’t remember it. First I told them maybe I wasn’t really old enough. They talked to some of the Meikan elders. At first they hoped maybe it was a fluke, like I’d regressed or something. They took me to see Annie Reese. I only knew where we were going when we pulled into her driveway and my dad got out of the pickup and ran in to talk to her. When they came back out Annie was really upset. And by that time Rose and the others had made the situation clear to me, so in the end I told them. I got out of the truck and said, "Yeah, you idiots. I finally woke up and realized how stupid you are. Now you have to leave me alone. It's the law." My mom started sobbing and some guy across the street was staring at us. I felt embarrassed to be around them at all, so I walked away and went to one of my new friends' houses in town. I had to go home eventually, but it was different then. They couldn't boss me around. Q: Do you really think the Addin didn’t know you were Meikan? Britney and Chelsea acted all shocked that I had been Meikan. I’m not sure. I think maybe some of them knew. It’s hard to say. Why else would they have been interested in such a young kid? It’s possible Rose knew and the others didn’t. The way she acted was different. She could have been told by adults to practice on me. Q: So then the Meikans shunned you? Annie Reese let everyone know about it and immediately no Meikans would even look at me. At first, I didn’t really care that I was shunned. I had new friends. And it was good that the uncool people who I knew around town didn’t try to bug me or say hello to me. If they had, it would have been really awkward with my knew friends. I saw that most of the Meikans shunned my family too. At home my family acted stiff around me. I could see that my dad was really angry when he looked at me, but he didn't raise a hand against me. My mom cried a lot. I thought she was just silly and hysterical. I had no idea how much it hurt her that I was taken. Then my dad and my brother moved away. My mom was pretty much alone because a lot of Meikans were too afraid to have anything to do with her, even though she still had the sign. They were afraid of me. I could see it in their faces and their hatred too. Q It’s odd. It doesn’t sound that terrible to be taken. It almost sounds like your family and other Meikans overreacted. It wasn’t a terrible thing for me. I've said that plenty of times. And I did think they overreacted. That’s how it was for me. I’m sure they saw it differently. They saw me change. I went from being a kid who was interested in the community, a kid who had dreams and goals for my own life and a kid who was really into saving forests and protesting clear-cutting to a kid who was passionate about the popular crowd and having all name-brand clothes and perfect make-up. There's a cost. You lose yourself, but you don't grasp that, so it doesn't actually hurt while it's happening to you. I didn’t care about our community anymore. I really thought they were delusional and I thought the Addin was much more practical and reasonable. The Addin knew how to run things. They had a hierarchy that made sense, based on how talented you were as well as good looks. When you’re in the Addin you want the Addin to be in control. It’s the most obvious thing in the world. You know that people are better off with the Addin in charge, even the people who don’t know about it. And all you want for yourself is to be accepted in the Addin. I could sit down and have dinner with my parents and not have any real problem unless they brought it up. I knew they had weird ideas that would screw things up, if they ever got their way. But once I was brought into the Addin I had older mentors who explained to me why I had to let my parents be the way they were. They weren’t important and as long as they didn’t stir up any trouble it was best just to leave them alone. Q: But you didn’t just let Meikans be. You gave the Addin names of Meikans in La Grande. A few months after I was taken I was asked to come and talk to some people, including the mayor. That was a pretty big deal for me. One of the Addin teachers let me out of class to go, so my parents didn’t have any idea about it. The mayor's people told me again how I had to accept that my family and other people I knew wouldn’t understand. They seemed disappointed that I had been shunned by Meikans so soon. That is another reason I suspect that my being taken wasn’t entirely an accident. But it could have been. It doesn’t really matter. The Addin never really took the treaty seriously. What they took seriously was the need to keep Meikans docile and quiet. Anyway they started asking me who was Meikan. They already knew about some people, but not about most of them. I didn’t know everyone’s last name at that age, but I could name off which kids were Meikan from all over town and they could then figure out who the families were. At the time I didn’t think about why. They wanted to know and I was so happy to be important enough to help them that I was all glowing and elated inside. Maybe I was just an immature kid or maybe its a specific Addin thing. I don’t know, but it never occurred to me at the time that I was betraying anyone or what the consequences might be. Q: But Aranka wasn’t Meikan. Why did you stop being friends with her as well? She wasn’t cool. She was nowhere near the popular crowd. After I was taken, all I cared about was being accepted by the popular Addin kids and doing what they wanted. Mostly I just couldn’t be bothered with Aranka. She was insignificant. When she kept following me around and talking to me, Britney told me that I had to get rid of her for good. She let me know that having a nobody like that act like your friend was really bad juju. It would hurt my chances in the social scene. So, I told her to get lost. I told Aranka I was just pretending to be her friend. Q Why was Aranka not cool? I don’t know… No specific reason really. She dressed very practically and she didn’t seem to care about what was in style. But it wasn’t even mostly about appearance. The social crowd can always find something about you to pick on, but they mainly do it because of who you are inside anyway. She wasn’t as quiet as a low-status person should be. She’d go ahead and talk, even when you were supposed to listen to the cooler people and work your way up to being worthy enough to talk. When the top girls decided someone needed to be punished, she didn’t seem to notice. She’d still laugh at that person’s jokes and talk to them. I guess most of all, she just didn’t play the game. She knew it was there, but maybe she didn’t know it was mandatory to play it. Or maybe she couldn’t play it the same way. Kyrennei are still Kyrennei even before they’re changed. Maybe there is something about them that is never going to fit in. Q: Do you feel hope for the world, given how powerful the Addin is? I do now. I can't really say more about it, because like you said it's confidential. But there is hope. For me, it's about compassion. That and I still believe people have good souls. If you're a Kyrennei Series reader, I would like to invite you to my hearth-side email circle. This is a small group of readers with whom I share the occasional virtual cup of tea and links to my latest posts. To add to the fun, everyone who joins my hearth-side email circle these days gets a free ebook in Kindle, Epub or PDF format. 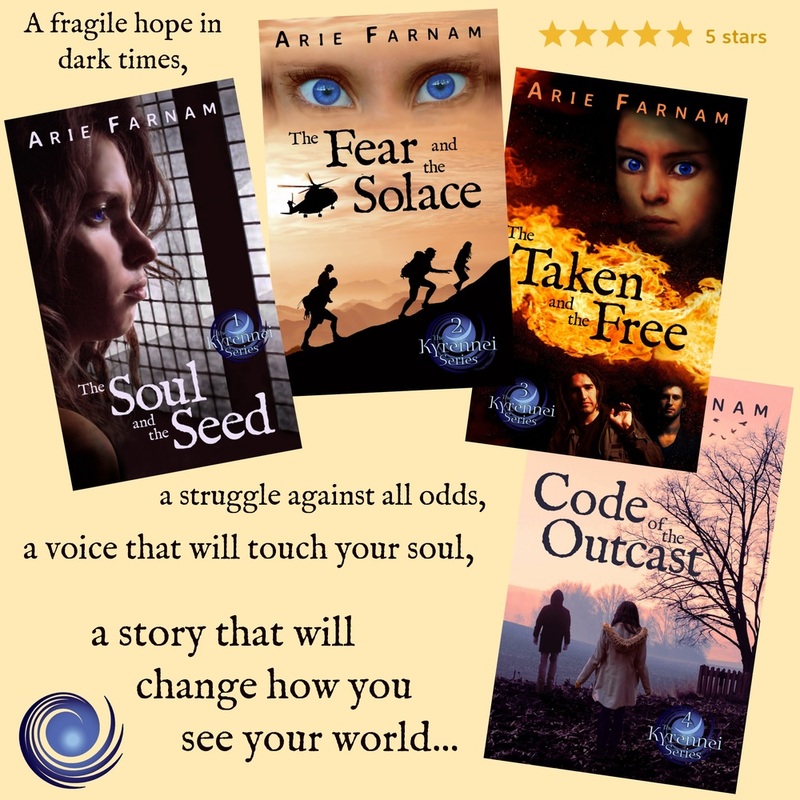 You can have either The Soul and the Seed (Book 1 of The Kyrennei Series) or one of the later books in the series (Including the new release Code of the Outcast). It’s your choice. If you haven't started the series, now is the time to do start with a free book. If you're already subscribed and want to get a free book, reply to one of the By the Hearth emails and let me know which one you want! There are all kinds of books on writing that will tell you how to develop deep, multi-dimensional characters. And yet most leave out a few easy and essential early steps that make all the difference. I’m not saying that character development is easy. Good, deep character development is very hard. It’s arguably one of the hardest things about writing fiction and also the most important thing. But there are harder ways to do it and there are easier ways to do it. This the easier way to do something that is hard enough even if you don’t make it any harder than necessary. Let’s get one thing straight right off the bat. Using real-life people as models for you characters is not plagiarism and it is not slander. The whole point of using a real person as a model for your character is that you want to come up with a new person. The model is only a starting point and usually only covers one facet of the character. The key point is that you actually don’t want one model for your character. You probably want at least three. You want one person who looks more or less like what you want your character to look like. You want another person who has a personality and speaking style like you want your character to have. And you want one person who has a job or situation like you want your character to have. It is much simpler to take these three things from three different people. That way you have the flexibility to work within your plot. And no one can say that you slandered them by putting them in your story. Why is it important to have models? Well, models make it easy. You don’t have to do it this way. You can make your ten or twenty essential characters up out of whole cloth and try to keep their faces and mannerisms in your head through your book or series of books. But… well, good luck with that. If you’re name is George Martin or Diana Gabaldon you can ignore this and all of my advice. Those authors are either doing this already or they are geniuses with astronomical IQs. Here’s a practical example of what I’m talking about. Let’s say you need a police officer in your story. There. You already have a job for your character. But figure out what kind of police officer, in what position, in what size of town you need. Then if possible find someone who is a police officer in that sort of situation. The job part is actually one situation where people like to be models for fiction. If possible, find a friendly cop in the kind of position you need and tell them that you want to write about someone in a similar position who isn’t them, who looks completely different and has a different personality but the same job. Professionals will often be thrilled to tell you all the crucial details about that job. I’ve got a landscaper in my current work-in-progress and my younger brother is a landscaper. It’s very handy to pick his brain to find out exactly what my landscaper should be doing at various times of the year. But my landscaper couldn’t be more different physically or emotionally from my brother. Okay, I went a bit backwards on this one. 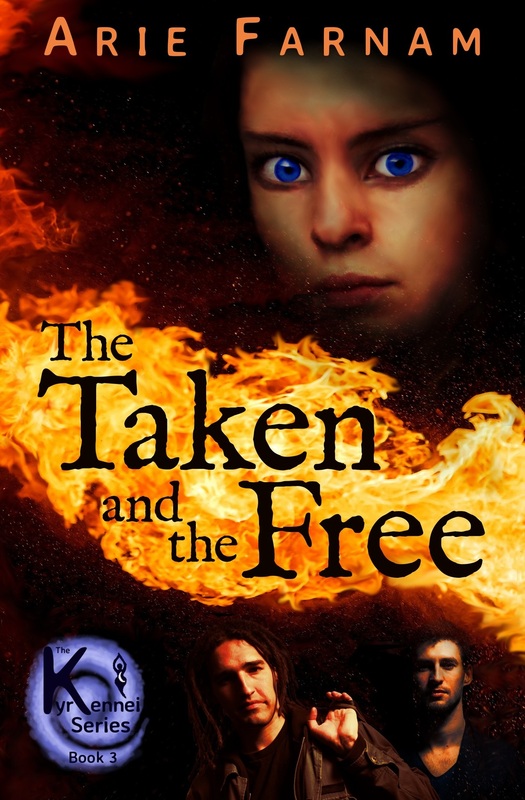 The characters at the bottom of this cover (Rick and Kenyen, as readers of the Kyrennei series will know) are recognizable but I actually didn't find these pictures on ShutterStock until I was finished writing the first three books. That made finding the right pictures hard. But I'd had these characters in my head for twenty years, and had a very clear picture of each of them, although Rick does sort of look suspiciously like an Iraqi friend of mine who likes to cook. As for the physical picture of your character, think about what physical characteristics will suit the character in your story. Don’t forget that besides hair color, eye color and height you have many other factors to play with. Don’t make all your characters be of average weight and build. Don’t make all your characters the same race as you. Give your characters some small differentiating feature. Once you figure out what general kind of physical appearance you need, try to find someone who looks like that. Think about your circle of friends and acquaintances or look up photos on Google. You can seriously google “Picture of tall brown-haired man” and get a ton of great pictures of tall, brown-haired men. Look at them and pick one. Then copy the link to your research file. Do NOT use this photo in any publication as you probably don’t have the copyright privileges to do so. But do refer back to it. Keep it in front of you enough that you can visualize the character. With a main character or other key character you might still want to change some important detail of the character’s appearance but make it something you can visualize in that photo. Pick a person without a scar and give them a scar in your mind. Or glasses. Or sideburns. The most difficult and most important part is your character’s personality. But again the same technique will serve you well. Choose a person to be your emotional model. This time it is really better to choose someone you know personally. Otherwise, you won’t know their reactions in enough depth. Then think about that person in various situations. How would he or she react if their spouse broke up with them or if they won a writing contest or if they had to tell a loved one terrible news? Get used to that person’s reactions and way of relating. Play amateur psychologist and make up reasons for why a person might have those particular reactions. Or if you know why your real-world model has those reactions, change the reasons up a bit. You can in fact use more than one emotional model for one character. Combine different traits from two different people. Again think how your character with the personality he or she has would react in various situations. I have a character in my current work-in-progress who is trans-racially adopted. I use what I know of people in that situation to inform me about her emotional make up. But she is also the kind of person who avoids conflict at all cost and tends to freeze up when there is tension. A relative of mine, who is also one of my trusted beta readers, talks about struggling with freezing up in the face of conflict. So, I use my relative’s reactions to inform how this character might react. The character isn't “supposed to be” my relative. The girl in the story is very different in other ways, but it is handy to have an emotional model. It is particularly handy to have one who likes being an emotional model and is happy to read through the story and pick out how I’ve slipped up on the personality type. That is a rare treat. You won’t usually be able to tell your emotional models that they have a personality double in your story and you might have to go on the run if you do tell, but it’s fun while it lasts. The next thing you do with your budding characters is print out a copy of this free character sheet I developed, combining the best qualities of the many character sheets out there. You’ll need a copy for each major character. Wait. You don’t have to fill out the whole thing immediately. In fact, you probably shouldn’t. Fill out as much as comes easily to you given your choice of models for this character. If you don’t know your character’s family history yet and it isn’t key to the plot in the beginning, leave it blank for now. You may find that the story will provide you with the answers you need as you deepen your plot. So, in the beginning, just fill out those parts you can and then come back later and fill in other parts as you go. Why am I asking you to do this exercise that looks like a worksheet from school and doesn’t seem to have much in common with writing? Because it will save you endless blood, sweat and tears later. You may think you know your characters well now but after 70,000 words and many months of work are you really sure you’re going to remember the make of this character’s car or the color of that character’s eyes? Even when it was mentioned only once somewhere in your narrative? Remembering those references will be much harder than you think. And finding them again is tedious and time consuming, assuming you even remember to look. What if you decide to put this manuscript aside for a couple of months and get back to it later? It will be much less work to get back into if you can quickly review the crucial information about your characters. Keep character sheets. I’ve made one for you and it’s free. I know the character’s desires are on the character sheet but it is likely that with many characters you won’t be able to come up with all of their desires in the very beginning. This is a step that starts in the beginning and keeps going throughout the writing process. Remember that good fiction requires conflict or at least a problem to be solved. Conflicts and problems create suffering of some kind in a character. And if you ask a Buddhist guru (or a writer) what the root of human suffering is, you will be told that it is desire. Without desire, there is no suffering and without suffering, there is no conflict. Make your characters yearn for something and you have story. Deny your characters what they want and you create suffering. There is a law in fiction that says that the more you make a characters suffer, the more your reader will love them. This is almost always true. You can make a character too pitiful and lose the reader’s sympathy and respect but generally if your character suffers, your reader will keep reading. Desire doesn’t have to be a fantastic dream or an overt goal and suffering need not involve physical pain. Sometimes a character simply wants to be able to live in peace or to find the answer to nagging internal questions. But this desire must be made clear and vivid to the reader. The more abstract the desire, the harder the writer’s job is. Suffering is the same way. While commercial fiction usually involves a character suffering in some dramatic way involving physical injury, grief, betrayal or denial of love, it is very possible to make a compelling story in which the suffering is deep and less easily understood. It is only that doing more abstract and less overtly tangible things with a character is harder to do well. Either before you write or in the early stages of writing your first draft, visualize new scenes in your head. Let them play like a movie a few times. Get a picture of the characters and watch how they move. Get a feeling for them and watch what they do and say. 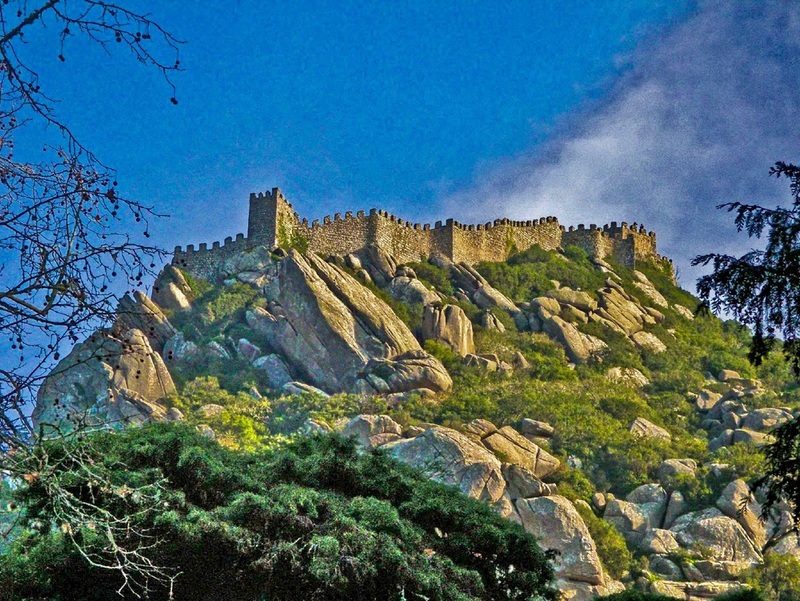 Try out the scene in a few different ways. What works best? What actions and words seem natural to your characters? I have been known to act out scenes from my stories, standing in the middle of the room and stepping back and forth to take on the roles of different characters in a heated debate or moving around the room to block out a combat scene, making sure the physical actions will add up in three-dimensional space. I don’t really recommend doing this when other people are watching or listening. It requires too much stopping and backing up and redoing to be very entertaining and your goal is not to be silly but to iron out specific details that will then come across very real in the story. Do I look slightly crazy while I talk to myself and have fights with the air? I might but this is another reason to do it in private. If the NSA is spying on me through my computer’s webcam, at least they’ll know what all my Google searches involving borders, bridges and weapons are about. Step 5: Start writing or plotting, whichever is relevant. There are two kinds of writers, it is said. The plotters and the pantsers. Plotters carefully plan out their story with note cards, time-lines and outlines before they ever sit down to write. Pantsers fly by the seat of their pants. They get the basic groundwork in place, particularly the settings, premise of the story, key conflict and the characters, including their initial desires. Then they sit down at the keyboard and let the characters do their thing. I’m a pantser, in case you hadn’t noticed. Pantsers don’t necessarily do less work in preparation for writing. Flying free in writing is best done if you have all the necessary back-up - well-developed characters, settings, premise and initial conflict. I usually know where the story is going within the next 20,000 words. And I have a vague idea of the ending but I don’t usually know how I’m going to get there. I have often pulled up Google Earth, plunked my characters down in one place and told them they have to get to another place, given whatever the conditions of the story are (chase, pursuit or search for something), and then I let Google Earth surprise me and the characters. It almost always works beautifully, providing me with plot twists I never would have come up with on my own. Oh, there’s a river there. That’s a problem. How are my heroes going to get across while being chased by helicopters. Ah, there’s a bridge… But only one bridge. And it will be guarded by the antagonists, obviously. But this isn’t a general guide to plotting. This is about characters. And which ever way you choose to write, whether plotting or pantsing, you have now come to the point where you have to just do it. You hold onto the sense of your characters as individuals that you have developed in the previous steps and you feel their desire while you work out the specifics of your story. This will result in what is called a “character-driven story.” But that is just a fancy name for good fiction. All good fiction is character-driven, even the fiction that is action packed. Real people faced with challenges and conflict change. Characters with a realistic personality should too. Aranka Miko, the main character in The Soul and the Seed, is initially a frightened teenager imprisoned in a dark cage. How she rises in a troubled world to kindle the first flicker of hope in a thousand years is the core of the story..
Maybe this is the hard part for some, but I contend that if you’ve done the previous steps well this will be the easy part. I have rarely decided beforehand how my characters are going to change. I have simple set up characters and given them unfulfilled desires and a conflict. Then I followed where they led and the characters changed by the time the story was done. I hadn’t realized when I started the story that the growth of the characters would be so obvious so soon. I also thought the only character to really change would be the main character. But that wasn’t the case. Because my major characters were strong and unique and had real personalities and they were faced with huge challenges, they had to change and I didn’t have to force it or consciously manipulate it that much. In case this doesn’t come as easy in every story, remember to go back to the character’s desires. Do they get what they want? Are they thwarted? Does what they wanted turn out to be as good as they thought it would be? How does this impact the character? When you are done with your first draft, it’s time to rewrite and edit, then edit some more, then put the story aside and pick it up again and edit some more, and then edit again… and again. That’s just the reality of writing. I edit certain parts roughly as I go and my first drafts are relatively clean. I rarely have to change major plot twists after the first draft is done, despite my seat-of-the-pants writing style. But I do have to edit and edit and edit. Everyone does who wants to turn out good writing. When you edit, pay particular attention to what your characters look like and what they say and do. Make sure you have kept their appearances consistent and that the actions and words of each character fit their personality and situation. If you have a feisty, firebrand for a heroine, you can’t suddenly have her meekly take insults just because the plot requires that she is calm and collected for once. You can get away with having her learn to be calm and collected but that is going to take some work. Read your text out loud and particularly your dialogue scenes. Go through dialogue several times, trying to hear the voices of your characters. What kind of voices do they have? Do they have an accent compared to you? What is the emotion behind the words? I hope these tips come in handy. What are your favorite tips for developing characters? I would love to hear from you. Put a comment in below and keep in touch. Join my intimate email circle and I'll let you know when I post more writing tips. I don't send a ton of emails, but rather a kind of virtual cup of tea every week or so. This is my protected little spam-free corner of the internet. Welcome. Thank you for subscribing to my hearth-side email circle. Welcome. And the featured author of the week is... oops! That wasn't supposed to happen yet. I'm not ready yet! Mys second book isn't out yet. I'm not ready! Oh well, no arguing with the gods of Goodreads. Yup, you guessed it. The featured author this week is yours truly. As a mark of my gratitude to all the wonderful readers at Goodreads I'm putting The Soul and the Seed on sale for 99 cents for just this week on Amazon. So, if there was ever a time to tell all your friends on Facebook and Twitter about it, now is the time. Get The Soul and the Seed here. This week also happens to be Mabon week, which is the time of thanksgiving in our family. Now, how timely is that? I am grateful to all the Goodreads members who are spreading the word about this intense, amazing book that I was so honored to birth into the world. Thank you also to my family and friends who have tirelessly helped with technical details, advance reading and spreading the word. Beyond that I am astounded into gratitude every day by the fact that I was given this idea, these words, this chance and the time to write it down. It was a gift of the universe and spirit, if anything ever was. The idea brewed for many years but the characters came like real people, telling me their stories. So, I am thankful to whatever it is that gave me this gift - goddess, spirit or my own luck of the draw in life experience. I have many gifts that can't be taken for granted, a husband who works a steady job, so that I don't have to work extra long hours like so many women today. I have a snug home and good fortune in health. A recent calamity at a friend's home - one of those completely unpredictable things that could happen any day to any of us and leave harm that will last a lifetime - has reminded me to give thanks every day that disaster doesn't strike. 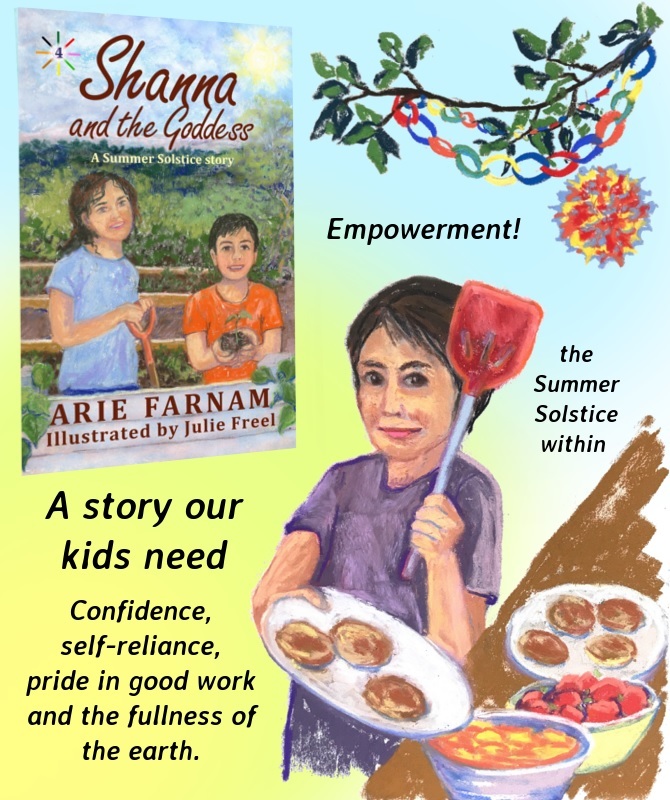 I have just finished writing a final chapter for Book 3 of the Kyrennei Series and that is a sentiment that comes out in the story as well - that simplest of gratitude, the miracle of another day of peace and wholeness. I don't take this moment for granted. And thank you for reading because then I am never alone. I was nominated by author Sarah Queen for the Work In Progress Blog Tour. This is where authors post about their current work in progress, divulge the first sentences of the first three chapters of their next book, and nominate several other authors to do the same. The second book in the Kyrennei Series is called The Fear and the Solace. This is the sequel to The Soul and the Seed. Reviewers have said they are anxiously awaiting this sequel, to which I can now say, "Almost there!" The Fear and the Solace should be published in about two weeks. The text is undergoing copyediting at a secret location in the Mid West and the cover is being polished to a high gloss. For those who don't know, the Kyrennei Series is a contemporary fantasy thriller with dystopian elements. The world of the story looks just like today's world and the setting is the Pacific Northwest. But a clandestine force usurps the wills and desires of individuals, forcing them to pursue more power for those already in power. The problems of our modern world can easily be blamed on this premise and readers find themselves looking over their shoulders and shivering, much as I did when reading George Orwell's 1984 all those years ago. It can be disconcerting when the dystopia is a bit too close for comfort. The primary character is Aranka Miko, a girl from the small town of La Grande, Oregon, who finds out the hard way that a fluke in her genes makes her a threat to the those who hold real power in today's world. First, she is imprisoned and forced to watch as others like her are killed. To escape, Aranka falls in with a group of desperate outlaws from every corner of the globe. They are at turns endearing and ruthless but they represent her only hope to escape from torture and death. Then an ambush separates Aranka from her new friends, including one who she might just love. This is where The Fear and the Solace begins. The modern-day freedom fighters known as J. Company despair of finding Aranka alive and she has come to be the symbol of their greatest hope. Aranka is stranded with every possible authority hunting her. And she is physically different from everyone around her. She can't easily hide. Readers of The Soul and the Seed may be interested to know that this time you get to hear from some other intriguing characters - both Cho and Rick, for instance. You also get to explore settings beyond the United States. But I won't spoil anything for you. You will get to read it soon enough. As I said, it's coming in about two weeks. Here is something to tease you with... as promised, the initial sentences of the first three chapters. My heartfelt thanks to Sarah Queen for tagging me for this. It's fun and a great way to get to know authors. Here is Sarah's post about her new upcoming book Evergreen. It sounds like a thought-provoking science fiction / fantasy. Now it is my turn to nominate some fellow authors to disclose some tantalizing tidbits about what they're working on. Morgan Daimler - I must say I was astounded by Morgan's book Murder Between the Worlds. I am not a mystery reader and the title totally turned me off. I only read it because it was supposed to have really interesting Pagan themes and I'll undergo almost anything (even formulaic mystery, I suppose) for that. How glad I was that I gave it a chance! This is not a formulaic mystery. It's fascinating speculative fiction about what might happen if the human world and the legendary world of Faerie were to partially merge. There is a murder mystery in the plot but there is much much more - great modern fantasy atmosphere, wonderful prose, lovable characters, realistic dialogue - in short, all the things I find in such short supply in fiction. I have been so overloaded with work these past few months that it is very hard to get my attention (as my children know all too well) and this was the only book to really succeed in the past three months. I am very interested to see what Morgan will do next. 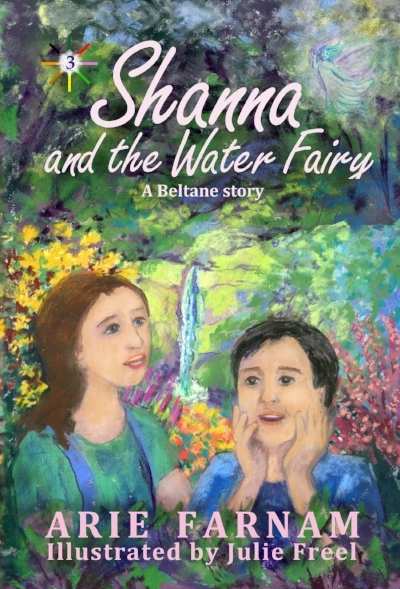 Debbie Behan - Debbie writes science fiction adventure with a fun atmosphere and the lore of Greek gods liberally mixed in. Her Lord of the Planets series starts with Home Worlds. She gets bonus points because my dear husband Dusan wishes she would have her books translated into Czech, so that he could read them. She gets good karma points for being an indie author who reaches out a hand to other indie authors, including those who are brand new and have few credentials... like, ahem... me. I wonder what she'll reveal about her next book. Lauren Shelton - I don't know Lauren as well yet but she is an intriguing fantasy author who has spent a lot of her life dreaming up her fantasies, just as I did. Her book The Hybrid also deals with myths and legends and their intersections with modern society. I see now that I have managed to create a pattern here. I didn't mean to but it is just as well and it may be a sign of the times. I am curious to see what Lauren will write next. Okay, you three. TAG! You're it. You write a blog post about your work in progress and include the first sentences of the first three chapters (at least as they stand at the moment). You link back to me and you link to several other authors who you nominate. Traditionally, you nominate four. I tried but it seems that most of my author friends are either too early in the process or a bit secretive about their WIPs, so I nominate three for now. Good luck!